This year as always we were energized by quality of innovations and new product introductions at Natural Products Expo West. It’s always great to see our customers growing and achieving success by: launching new products, gaining distribution and expanding into the new categories! It’s also particularly interesting to see many new functional products that leverage the notion of food as medicine. It felt like there were hundreds of products for every aisle in the grocery store that featured turmeric, ginger, herbal remedies and plant-based foods. This showcases a growing and sustained consumer trend in healthy eating and rewarding brands for clean label, organic and non-GMO ingredients that are easy to pronounce and trace back to their origins. Walking the aisles of the Expo we couldn’t help but wonder: What will happen as the demand for trendy ingredients like organic turmeric, ginger or plant-based protein continues to flourish? The truth is ingredients that are in high demand also have a high probability for being fraudulent. We’ve all heard about adulterated honey schemes or whey protein that magically becomes “organically certified” on its way to the U.S. from Asia, but as new ingredients become more popular, they also become susceptible to joining the growing army of fraudulent foods. This is why QAI strongly believes that the organic certification process serves as an important hurdle in ensuring that all ingredients used in consumer products are validated through a rigorous third-party process focused on core principles of organic certification: cultural, biological and mechanical practices that foster cycling of resources, promote ecological balance and conserve biodiversity. 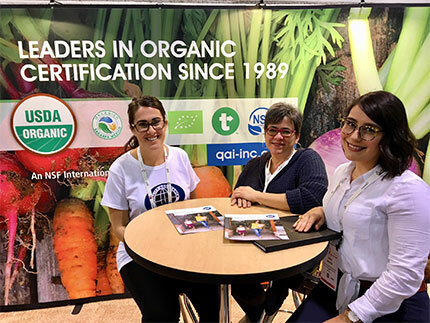 We really enjoyed speaking with many companies at the show that are just taking their first step on the road to the organic certification. We know it’s a fairly complicated process, but we found that by working collaboratively with our customers we can help to move forward the industry’s commitment to organic practices. Besides being good stewards for the land, the animals and the environment, we also satisfy consumer demand for more organically certified foods.